Last revised 13 November 2009. 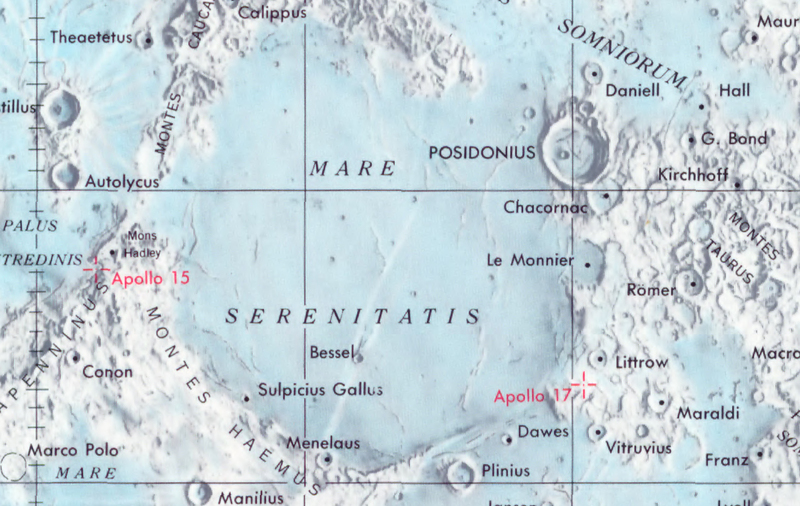 The Apollo 17 landing site is in a spectacular location called The Valley of Taurus-Littrow on the southeastern edge of the Sea of Serenity (Mare Serenitatis). Sometime about 3.8 to 3.9 billion years ago, a mountain-sized asteroid or comet hit the Moon and blasted out a basin nearly seven hundred kilometers in diameter. Around the rim of Serenitatis, great blocks of rock were pushed out and up, forming a ring of mountains. In places, the blocks quickly fell again, and left radial valleys among the mountains. Taurus-Littrow is one such valley, located just south of Littrow Crater in the southwestern Taurus Mountains ( 0.9 Mb ) that form the highlands east of Serenitatis. About 100 to 200 million years or so after Serenitatis formed, lavas welled up from the lunar interior and began to fill the low places. Many of the flows first reached the surface at the weak, fractured margins of the basin; and, as Schmitt and Cernan discovered, at some stages the flows were accompanied by fire fountains that blanketed their surroundings with tiny glass beads. Some of the beads were orange in color, but most were very dark. Even from Earth, the borders of Serenitatis look dark and, prior to the mission, there were many who speculated that this was an indication of recent volcanic eruptions. Taurus-Littrow is elongated on an axis that points northwest toward the heart of Serenitatis. At its inner, southeastern end, the valley butts up against a large, blocky mountain called the East Massif. Toward the south, a narrow outlet - partially blocked by a large crater - leads off to another valley. On the west side of this outlet, a second blocky mountain called the South Massif forms the southwestern wall of Taurus-Littrow. North of the East Massif, across an outlet into another small valley, the Sculptured Hills and farther to the west, the North Massif form the remaining walls of Taurus-Littrow. Between the North and South Massifs, the main exit from the valley leads out toward Serenitatis. This exit is about seven kilometers wide and is partially blocked by a kilometer-high hill called Family Mountain and, also, by a fault scarp that stretches between the North and South Massifs. In places, the scarp is 80 meters high. The inherent geologic variety of Taurus-Littrow was a major reason for the selection of the site. From a landing point out in the middle of the valley, the crew could sample the dark soil, collect samples of the valley-filling lavas dug out by impacts, and sample pre-Serenitatis crustal material in both the North and South Massifs. Of particular interest were a number of large boulders seen in Apollo 15 orbital photographs of the lower slopes of the Massifs. Some of these boulders are sitting at the ends of tracks which show that they had rolled down from outcrops high on the mountains. Additional points of interest included a South Massif avalanche that drapes across the southern end of the scarp, and an intriguing crater called Shorty which sits like a dark blemish at the northern tip of the landslide outflow. Here, some of the geologists thought, might be a young volcanic vent. And finally, there were the Sculptured Hills which, from orbit, look as though they are not directly related to the Massifs and the Serenitatis impact but, rather, it was thought, might represent ejecta from the more recent Imbrium impact. During the preceding missions, none of the crews that attempted pinpoint landings actually landed farther than about a half-kilometer from their target. Of course, as had happened in case of Apollo 11, larger errors were possible, particularly if the flight-path could not be updated during the powered descent; and NASA wanted to be sure that Cernan would be able to land even if Challenger were headed as much as four kilometers long or short of the target and as much as three kilometers to either side. 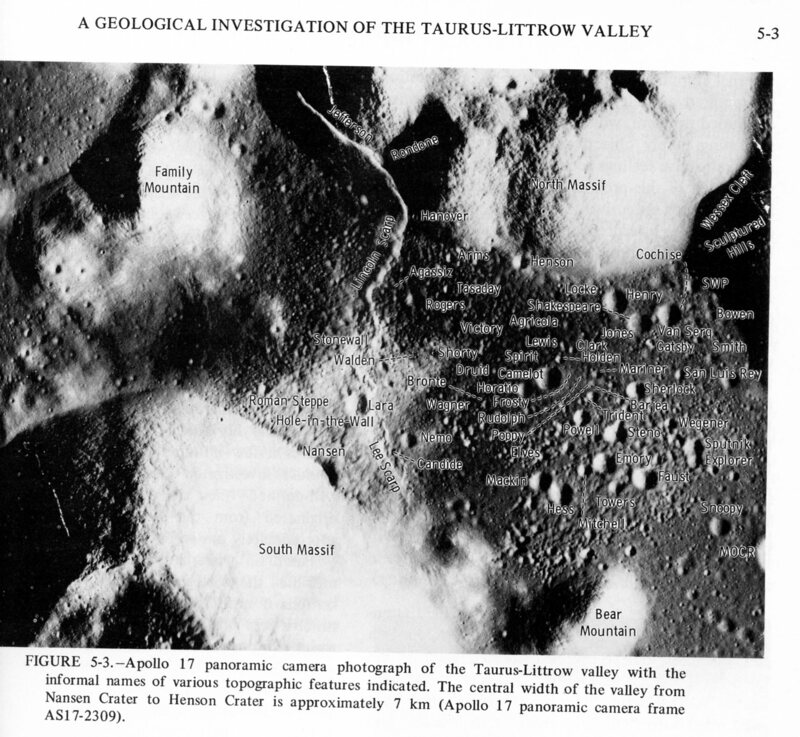 Taurus-Littrow is not a large valley; and, indeed, the Apollo 17 crew was able to cover nearly half of it during their three geology trips. Still, it is large enough to contain the landing ellipse and several more besides. The actual target point was on the valley's central axis, well away from the Massifs, and about six kilometers short of the scarp. This northwestward placement was chosen so that the crew would fly over the Sculptured Hills at substantial altitude as they entered the valley and, later, could drive to the foot of the South Massif without violating walkback constraints. In detail, the target area is a relatively smooth patch of ground in the midst of a cluster of large craters. The largest of these is Camelot Crater, about 600 meters across, and it promised good samples of the valley fill. Camelot is about a kilometer west of the target and provided Cernan with a visual fix at pitchover. Closer at hand, he had a trio of small craters called Punk, Rudolph, and Poppie to show him exactly where to land. He wanted to land midway between Poppie and Punk and just south of Rudolph. Most of the craters and other features on the Moon which can be seen from Earth have had names for a long time. With the advent of Ranger and, in particular, Lunar Orbiter, lunar maps became more detailed and the list of named features grew but, as the time for the landing missions neared, there were still many unnamed features which were, nonetheless, going to be of importance to the crews. As Jack Schmitt indicates in his Apollo 17 commentary, he and others in the Astronaut Office started naming features in preparation for Apollo 8, the first lunar mission, because the crew was going to be using a variety of craters for landmark tracking and, as pilots, they knew that names would be much easier to remember and recognize than numbers. Later crews wanted names for features that they would see at pitchover and might later visit or use for navigation on the ground. Prior to Apollo, formal responsibility for naming features on the Moon (and other planets) rested with a committee of the International Astronomical Union. In the interest of cooperating with the international scientific community, for each mission NASA generally submitted a list of names for formal approval - albeit, sometimes after the mission was over. Generally, the only objections made by the IAU were to names with religious overtones and those honoring living persons, political figures, and philosophers. "No one (at NASA) has responded to my previous communications on the subject...I have brought the objections of the committee to certain practices adopted by various Apollo missions, in the question of lunar nomenclature, to the attention of NASA. Many of the names assigned by them to small features, for purposes of identification during the actual Apollo mission, were inappropriate according to our standards, or even duplicates of names already assigned. I have received a reply that these names are 'unofficial', and therefore are not being submitted for approval. Unfortunately, this overlooks the fact that rock samples taken at various of these locations has (sic) the identifying names attached. Hence the names automatically get into the literature. Furthermore, some of the very large-scale maps used for the expedition have also been widely circulated. I have asked that the names for Apollo 17 be submitted to me for consideration and preliminary approval. Thus far, I have not had any satisfactory response and the mission is scheduled for December. I am writing a last minute request to NASA for the desired information. I have also had some telephone conversations with NASA individuals on this point, and have received the reassurance that they will follow the principles outlined." As editor of this Journal, I believe strongly in the prerogative of explorers. The names discussed here are the ones used during the mission. Many of the choices are charmingly personal - Punk, Poppie, Van Serg, Camelot, and even a Bear Mountain. The following is a brief conversation Gene Cernan and I had on February 21, 1994 about the crater names. The following descriptions are based on material written by Jack Schmitt during preparations for Apollo 17. His words are indicated by quotation marks and, with his permission, have been lightly edited. Figure 5-3 ( 0.7 Mb ) from the Apollo 17 Preliminary Science Report shows the named features. "The names chosen for crater designations (at Taurus-Littrow) generally attempt to honor men and women who have explored the far limits of human endeavor. These men and women are representatives of many, many others of their generations who were or are true humanists - no matter what enterprise may call upon them for excellence. Most of the crater designations reflect the bias of my own specific interests in literature, history of western man, geographical exploration and geology. Several other names were suggested by other individuals deeply involved in our mission. Their interest and contributions are much appreciated, with particular thanks due to Robert Parker, Eugene Cernan, James Head, Edward Wolfe, and Beth Williams." Agassiz (crater) - "Louis Agassiz was one of several natural scientists who studied geological and biological samples and other information returned by early Army explorers of the American West (see Emory). This name also honors all the modern investigators upon whom falls the responsibility and opportunity of amortizing our scientific investment in space." Agricola (crater) - "This was the Latin name of Georg Bauer (1494-1555), who wrote some of the first known treatises on mineralogy, geology, and mining. His most famous work was on 16th Century mining and metallurgy. This book, De Re Metallica, was translated from Latin into English by Herbert Hoover and his wife. Hoover (the 31st President of the United States) is also honored by this crater designation for his lifelong intellectual exploration of history and government and for his humanistic concern for all people following World War I and the Great Depression." Journal Contributor Harald Kucharek notes "'Bauer' is German for 'Farmer and 'Agricola' has the same meaning in Latin. During Bauer's era, scholars not only published in Latin, but also changed their names to the Latin equivalents." Barjea - Named for Gene's wife, Barbara Jean Cernan. Journal Contributor Brian Lawrence deciphered this one. Bear Mountain - "Named because of its shape and because of its resemblance to a mountain of the same name near Silver City, New Mexico." Jack Schmitt grew up in Silver City. Bowen (crater) - "Norman L. Bowen, geologist, performed experiments on the crystallization of silicate liquids that led the way to our present understanding of the origin and evolution of igneous rocks; an understanding which is now a critical element in our interpretations of lunar history." Bowen Crater is near geology Station 8 which Cernan and Schmitt visited on their third EVA. Bronte (crater) - "Charlotte Bronte, novelist of the 19th Century, was representative not only of the literary innovations of her times, but also of the first golden age of women in literature." Camelot (crater) - "The kingdom of the legendary Arthur, whether real or not, represents the seed of freedom, compassion, and achievement that exists in mankind. It is possible that our own movement into space was in part inspired by the influence of this Arthurian seed on John F. Kennedy. In this case and others, the imperfections of Camelot accent the greatness of its goals." The crew visited Camelot during the second EVA, and Schmitt's lusty rendition of the Lerner and Lowe song as they approached it is memorable. Candide (crater) - "Named in honor of Voltaire, the 18th Century French novelist, who was instrumental in re-establishing humanism as a force in the politics of nations after centuries of repression. Although imperialism and new repression in the name of humanity followed, and is still with us, the re-establishment of humanism produced strong defenders of the individual." Cochise (crater) - "Chief of the Chiricahua Apaches, Cochise, a humanist in his own right, is a representative of the first race of explorers of the Americas. The Indian people, although victims of the antipathy still felt between different races, nonetheless were among the foremost explorers of man's natural environmental and spiritual frontiers." Cernan and Schmitt made a brief stop at the rim of Cochise during the third EVA. Druid (crater) - "Honoring the precursors of western man who, though dimly seen through the mists of Stonehenge (near Salisbury in the U.K.), directed the eyes of an earlier race than ours toward the solar system and the stars." Elves (crater cluster) - "A field of small craters honoring all those who prepare the crew and their spacecraft for the journey." The center of the Elves cluster is about a kilometer north and bit west of the crater Mackin. Emory (crater) - "William H. Emory was one of the most capable members of the United States Army Corps of Topographical Engineers who, in the quarter century prior to the American Civil War, systematically explored the American West. This group of military officers and explorers had specialized training in the physical sciences and engineering, and held many close parallels to the Astronauts and Cosmonauts of today. Following in the footsteps of Lewis and Clark and the mountain men, they provided the basic information required to open up the West for travel and eventual settlement." The crew planned to stop at Emory during the first EVA but, because they ran short of time, made a geology stop near Steno, a crater much closer to the LM. Explorer (crater) - "Named for the United States' first earth satellite for the series of unmanned spacecraft which have investigated the moon and other planets." Family Mountain - "Named in honor of the families of the crew members and their associates. Their sacrifices go unrecorded but not unrecognized." Faust (crater) - "Named for the traditional folk hero perhaps most fully developed by Goethe. The name honors both the authors of epic literature and also the unquenchable human thirst for knowledge and understanding of nature." Frosty (crater) - "Named in honor of the Christmas season and today's children who will follow Apollo toward the far frontier of space." Apollo 17 was launched on December 7, 1972 and the crew returned to Earth twelve days later on the 19th. Frosty is one of the craters that Cernan named, all of them close to the planned landing spot. Gatsby (crater) - "Honoring F. Scott Fitzgerald, one of the foremost novelists of his generation." Hanover (crater) - "Honoring one of the many small mining towns of the United States which provided - and continues to provide - the material resources required by our nation in its search for the future." Hanover Crater is on the North Massif, just east of the Scarp. The town of Hanover, New Mexico, is about 20 km ENE of Jack's boyhood home. Henry (crater) - "Named for Prince Henry the Navigator (1394-1460), supporter of early Portuguese explorations along the African Coast, though not an explorer himself. With his name, we also honor the managers and supporters of modern exploration." Cernan and Schmitt drove by Henry during the first stage of their EVA-3 traverse. Henson (crater) - "Honoring Matthew Henson, who accompanied Robert E. Peary to the North Pole, and all members of ethnic or social minorities who reach for greatness as individuals beyond the confines of their minority status." Hess (crater) - "Named for Harry Hess, chairman of the Space Science Board of the National Academy of Sciences during the formative years of Apollo. This outstanding scientist was instrumental in ensuring that science contributed to and took advantage of the success of the Apollo program." Holden (crater) - "J. D. Salinger's Holden Caulfield is representative of the characterizations of a post-World War II generation by which their creators forced an introspective look at ourselves and an understanding look at those around us. In varying degrees, these authors have influenced that generation's present search for a bridge between the past and the future." Hole-in-the-Wall (point of ascent on the Lee Scarp used by the Apollo 17 crew) - "A common fictional geographical designation from western literature, used here to honor the authors whose work carried the excitement and challenge of the American West around the world." Horatio (crater) - "Horatio Hornblower and his compatriots in the historical fiction of C. S. Forester provide the humanly personal insight into how ordinary, but then how extraordinary, heroes turn out to be. From the wooden ships and pathways of the sea of which Forester wrote, came many of the space-faring traditions that guide our course toward the stars." Horatio is just west of Camelot and the crew drove past it on EVA-2. Jefferson Scarp (North Massif segment of the Taurus-Littrow scarp) - "Thomas Jefferson was one of the leading political philosophers of history and a practical innovator during the early growth of our republic. His instigation of the Louisiana Purchase and the subsequent exploration of those territories provided the strength required to preserve the Republic." Jones (crater cluster) - "Named for John Paul Jones (1747-1792), Scottish-born naval hero of the American Revolution who established his adopted country as a seafaring nation which was, eventually, without peer." Lara (crater) - "Named for Boris Pasternak's heroine from Dr. Zhivago and honoring all the inspiring women of history, known and unknown." Lee Scarp (southern valley segment) - "Robert E. Lee was a man of immense ability and honor who, in his dedication to friends and tradition, found personal compromise with the future impossible. Such a national tragedy should represent a lesson we can safely learn only once." Lincoln Scarp (northern valley segment) - "Abraham Lincoln's compassion, spirit, and intellect prevented the dissolution of a union; a dissolution after which the seed of freedom might have survived in the hearts of men but not in their societies." Lewis and Clark (craters)- "William Clark and Meriwether Lewis began the American exploration of the western territories purchased from France by the young nation. Inspired by Thomas Jefferson, their explorations laid both the psychological groundwork for the future expansion of the United States in the West and the geographical basis for our growth and strength as a free nation." Locke (crater)- "John Locke is representative of an age when interest grew in experimental science and observational philosophy as a substitute for the uncritical acceptance of the science and philosophy of the past." Cernan and Schmitt drove past Locke and the nearby crater Henry at the start of the third EVA. Mackin (crater) - "J. Hoover Mackin, geomorphologist, teacher, and gentleman was known for his ability to bridge the gap between quantitative and qualitative geologic studies. In later years, he was an irrepressible innovator and a supporter of lunar exploration." Mariner (crater) - "In the tradition of Coleridge's Ancient Mariner, the modern day Mariner spacecraft are telling us of the unknown of the solar system and, in the telling, guide our way to understanding." Mitchell (crater) - "Billy Mitchell, through his own sacrifice, showed us the practical and political reasons for being a truly air-faring nation. From the resulting foundation in aeronautics, we have moved into space, hopefully having learned his lessons well." MOCR (crater) - "The Mission Operations Control Room is the area at the Manned Spacecraft Center in Houston, Texas, from which the Apollo missions are directed. The name honors all those people who provide the flesh and brains of every mission and who are truly the explorers of Apollo." Nansen (crater) - "Named for Fridtjof Nansen (1861-1930), Norwegian Arctic explorer, statesman, and Nobel Peace Prize winner (1922). His studies of oceanography, meteorology, and nutrition underlay all future exploration work in the Arctic. Nansen represents the international character of all of mankind's exploration - past, present, and future." Nansen is a trough at the base of the South Massif and Station 2, the first major geology stop of EVA-2, was conducted there. Nemo (crater) - "Although associated with Jules Verne, the patron novelist of lunar explorers, the term Nemo also recognizes the innovations in the novel and in personal philosophy produced by John Fowles and his contemporaries such as John Knowles, Jerzy Kosinski, and Ray Bradbury." North and South Massifs - "Massif is a French term for a large mountain mass." These mountains frame the western end of Taurus-Littrow. Poppie (crater) - 'Poppie' is the nickname given Gene Cernan's father, Andy, by Gene's daughter, Tracy. Throughout the Apollo literature, the name is mis-spelled as Poppy. In the 1990s, Gene, himself, was known as 'Poppie' by Tracy's young daughter. Powell (crater) - "John Wesley Powell was one of history's outstanding explorers. One of the last true generalists in the explorations of the American West, he exemplifies the breadth of knowledge required in our explorations of all frontiers." Punk (crater) - Gene Cernan's nickname for his daughter, Tracy. Rogers (crater) - "Named for Will Rogers, American humorist, and Buck Rogers, early (fictional) space hero, both of whom provided immeasurable inspiration to their own generations and to future generations." Rondone (mountain) - "Rondone is a mountainous region of south central Norway and, as the legendary home of Peer Gynt, the name honors the drama of Ibsen, the music of Grieg, and all other innovators in their respective arts." Rudolph (crater) - "Named for the Christmas season's famous recent addition and most inspiring hero." Like Frosty, Punk, and Poppie, Rudolph is near the actual landing site. San Luis Rey (crater) - "Named in honor of the novel, The Bridge of San Luis Rey, by Thornton Wilder, which was a milestone in the growth of modern literature." Sculptured Hills - "Domical hills surrounding the Littrow area that are so named because of their sculptured appearance." Sherlock (crater) - "Sherlock Holmes, whose adventures were preserved for us by Dr. Watson, was not only the world's most famous and most brilliant detective, but was also one of the leading geological thinkers of his time. His knowledge of London soils and many other aspects of nature, combined with his use of deductive reasoning, serve as examples to all who aspire to understand the worlds around us." Shakespeare (crater) - "Named for England's bard whose poetry and dramas are known not only for their beauty and their timelessness in the portrayal of the human condition, but also for their perfection of characterization." Shorty (crater) - "Recognizing Richard Brautigran's collection of short stories, Trout Fishing in America, and other books which bring the literature of youth and life from the foundations of Salinger into the present." Cernan and Schmitt visited Shorty during EVA-2 and, on the southern rim, found a deposit of orange soil. Smith (crater) - "Honoring William Smith (1769-1839) and other natural scientists of the 18th and 19th Centuries who established the fundamental axioms of geology from which we now build our theories on the evolution of the earth and, indeed, of all the planets." 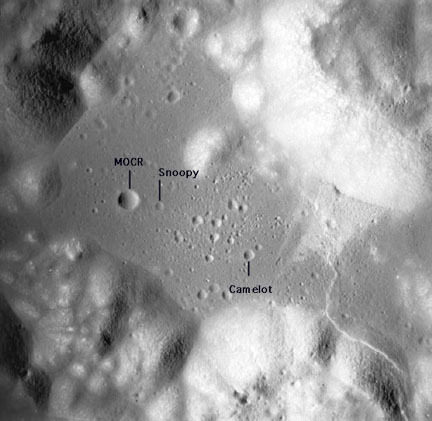 Snoopy (crater) - "Named for the sometime-aviator dog in Charles Schulz' Peanuts comic strip and the 'longtime' supporter of quality and humor in space exploration." Following the 1967 Apollo fire that took the lives of astronauts Grissom, Chaffee, and White, Snoopy became the symbol of the reinvigorated Apollo quality assurance program. 'Snoopy' was also the name of the Apollo 10 LM and, during our February 21, 1994 meeting, Gene offered the following comments. "I probably had more to do with naming the Apollo 10 spacecraft than anybody, because I started it during a simulation. We didn't like the call signs 'Gumdrop' and 'Spider' that they used on Apollo 9. So I told Tom Stafford, "Let's start calling John Young 'Charlie Brown'. (Charlie Brown - 'the rounded-headed kid' - is Snoopy's owner in the comic strip.) And it was fun, because it wasn't just in simulators. We called him Charlie Brown in the office. And, if we were going to call him Charlie Brown, then our call sign had to be Snoopy. And, we realized that, by naming our spacecraft Charlie Brown and Snoopy, we could give the Snoopy Award a little more pizzazz, a little bit more exposure, and make it more meaningful. And after we did that, we had little Snoopy dolls that people would bring in and lay on top of our simulators." Spirit (crater) - "'The Spirit of St. Louis' honors not only the historic achievement of Charles Lindbergh, but also the search by Lindbergh and others for the reasons for uniqueness in the human spirit." Sputnik (crater) - "Named for the USSR Earth satellite series, the first spacecraft put in Earth orbit by mankind." Steno (crater) - "Honoring Nicholas Stenonis (alternately Niels Stensen or Nicolaus Steno), a Danish natural scientist of the 17th Century, and all those known and unknown men and women who, with Steno, began to recognize the basic truths that underlie the physical sciences." Cernan and Schmitt made their first geology stop near Steno Crater on EVA-1. Stonewall (crater) - "Named for Stonewall Jackson, Lee's remarkable and dependable lieutenant, and honoring all those men who fought and died for these United States. This name also honors those historians who have recorded and interpreted the deeds of the past upon which we must build our plans for the future." SWP (crater) - "Named for the Science Working Panel, the NASA advisory panel on the scientific aspects of the mission." Tasaday (crater) - "Named for the 'Stone Age' tribe which was 'discovered' in the Philippines in 1971. Because of living in a dense rain forest, they are supposedly unaware of the moon's existence." Tortilla Flats - "Tortilla Flats honors John Steinbeck and all writers who, in the 1930's and 40's, made us aware of the human side of the nation. With this legacy, today we attempt to equalize individual opportunity within the limits of human differences." Trident (craters) - "An overlapping, triplet crater cluster shaped something like the three-pronged spear carried by the classical god of the sea, Neptune or Poseidon." Trident lies just south of the planned landing spot. Trident lies south of the landing site, beyond Poppie. Victory (crater) - "Specifically honoring Winston Churchill, a political giant in the continuing struggle to preserve the spark of individual freedom resting within the 'English-speaking peoples'." Journal Contributor Brian Lawrence notes that Churchill's famous 'Victory' speech was made in the House of Commons on 13 May 1940, in the very early days of World War II. Churchill said, in part, "What is our aim? ... Victory, victory at all costs, victory in spite of all terror; victory, however long and hard the road may be; for without victory, there is no survival." Wagner (crater) - "Named for the great German composer whose works represent one on the high points in the development of Grand Opera; honoring Wagner as a representative of the composers whose works were a true flourishing of this art form in the middle to late 19th Century." Walden (crater) - Honoring Henry David Thoreau and other poets such as Robert Frost who have shown us the profound personal insight that exists within the simple aspects of nature and of mankind if we only pause to observe and ponder." Thoreau lived at Walden Pond, south of Concord, Massachusetts, and was sometimes known as the 'Hermit of Walden'. Wessex Cleft (dividing the North Massif from the Sculptured Hills) - "Wessex, with its deep-rooted place in the far history of England and in the novels of Thomas Hardy, symbolizes the intangible strength that the land transmits to its people the world over. People have always been in transit from the land or to the land; now, space has offered the awesome possibility of final separation."